Africa’s geographic diversity has provided sanctuary for the world’s most amazing animals, some of which have evolved in truly unique directions. There are those that continue to steal the spotlight, and there are those elusive, funny-looking creatures that are just aching for attention. The stuff of legends, the latter are often overlooked. Widespread in Africa’s equatorial regions and a great addition to Africa’s wildlife, the colobus monkey is not getting half the publicity it deserves. 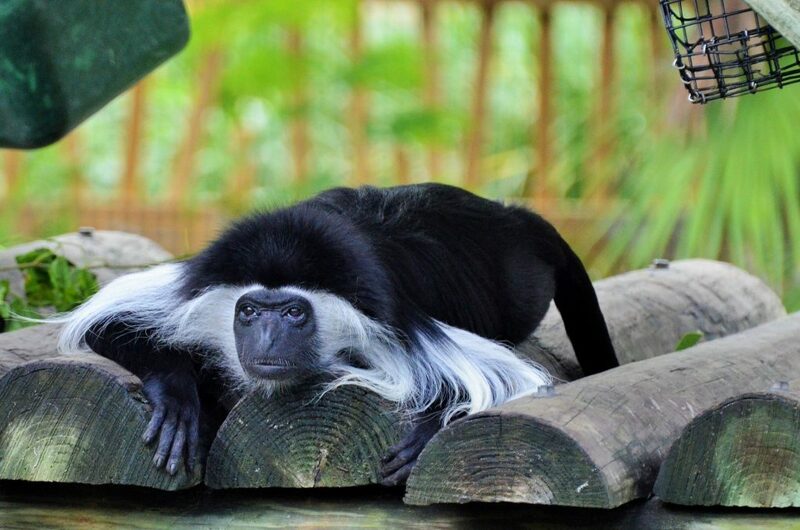 Its name, colobus, means “mutilated” in Greek, and there’s a good reason for it – these monkeys have no thumbs, an adaptation that helps them move around trees faster. They are excellent acrobats, jumping from one branch to the other, taking incredible leaps as high as 50 ft (15 m) into the air. Their lengthy tail, longer than their bodies, helps them keep balance. The long hair on their back acts as a parachute, slowing them down when they reach a branch. 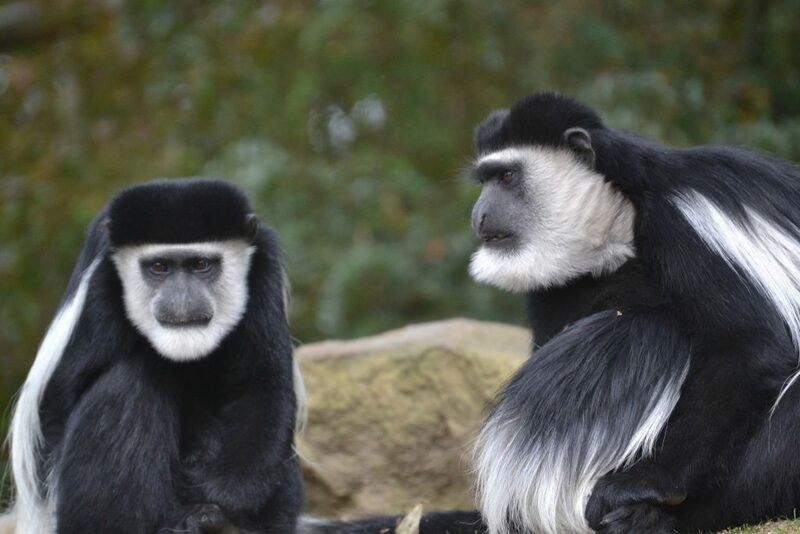 Black-and-white Colobus monkeys are native to 15 African countries, and live in all types of closed forests – coastal forests, inland, high-country, mountain forests, gallery forests, and rarely come down from trees. 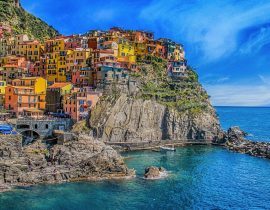 If you’d like to see them up close and personal, some of the top countries that you’d be able to do so are Uganda, Kenya, and Tanzania. Serious and big-nosed. 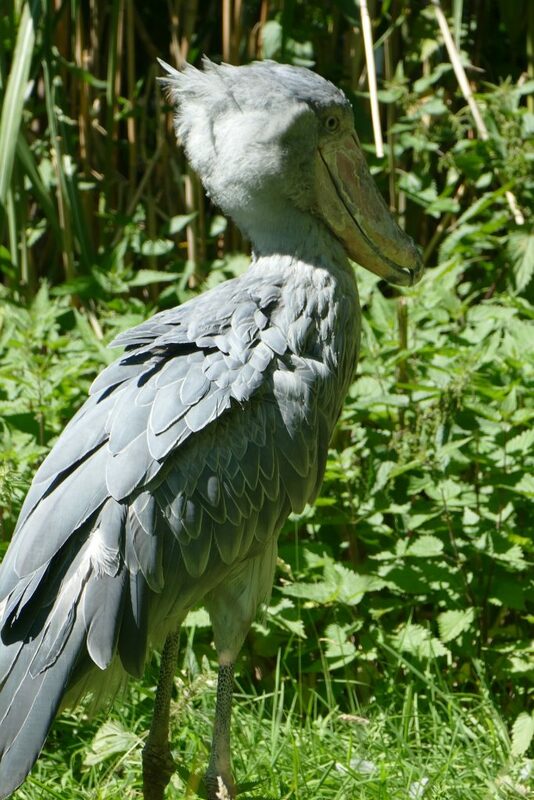 That’s the shoe-billed stork, also known as Whalehead or simply shoebill. You guessed it: its name comes from its huge shoe-shaped beak. And that’s not the only thing that’s big about it. In fact, this strange bird seems completely out of proportion. 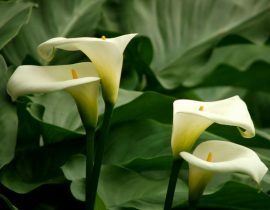 It can grow up to 5 ft (1.5 m) tall and 4 ft (1.2 m) long and has massive feet. Not to mention it looks like a living relic from prehistoric times. Despite being called a stork, it is more related to pelicans and herons. 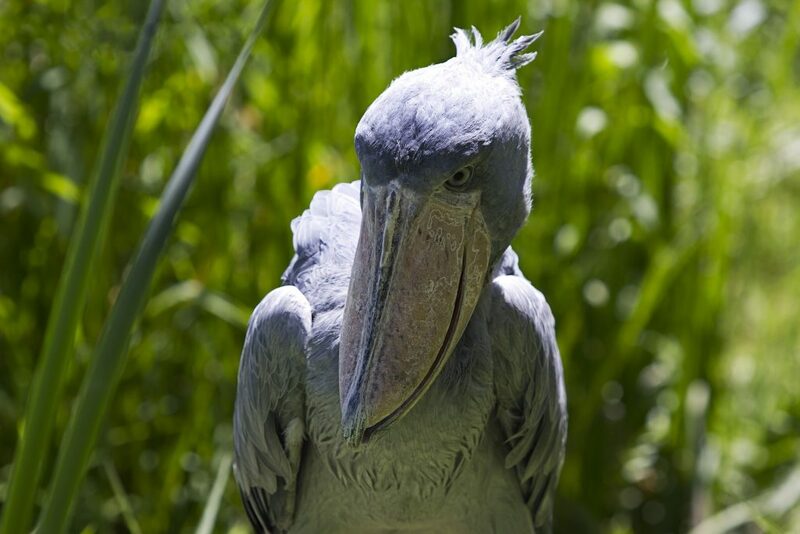 The shoebill lives in tropical swamps, marshes, and wetlands in Eastern Africa, from southern Sudan to Zambia. No wonder it earned itself the nickname of Africa’s swamp king. Unfortunately, it is a vulnerable species, with only 8,000 left in the wild, and the best place to see it in action remains Zambia’s Bangweulu Wetlands. Don’t be fooled by its cuddly appearance. These creatures are actually violent, to say the least, a good example that size and looks do not matter. 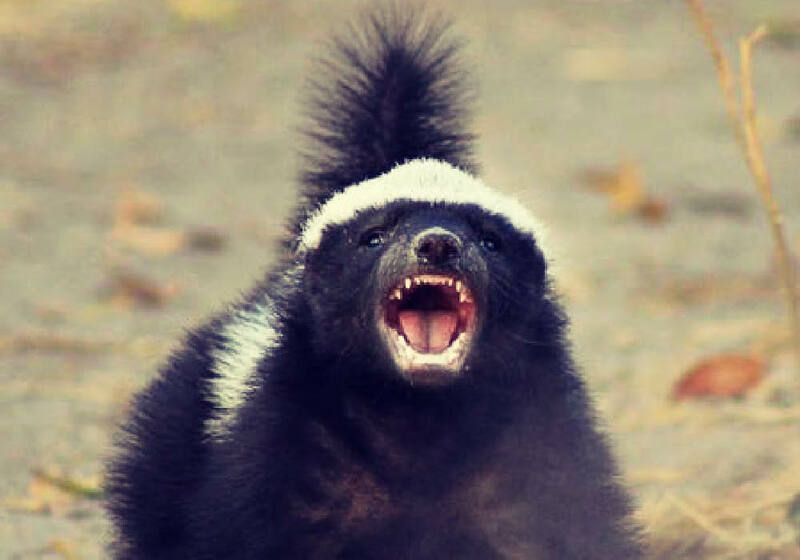 With a nasty temper, honey badgers are eager to pick a fight. They attack lions, buffaloes, even humans. Their bite is so powerful they can repel a lion attack, yet their key strength remains their endurance. During a fight, they can hold their position for far longer than their opponent, thus wearing down large animals. 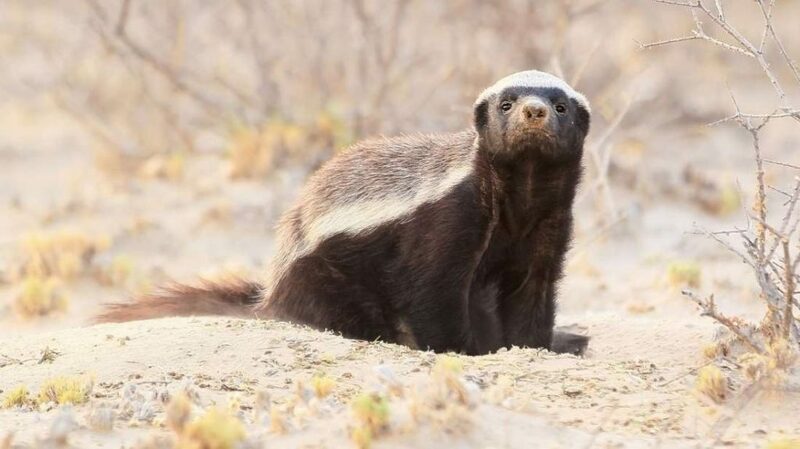 With a wide habitat tolerance, honey badgers can be found throughout sub-Saharan Africa. 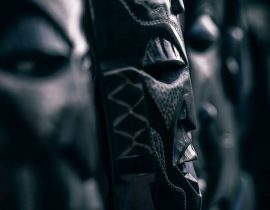 Madagascar and Botswana are two destinations that you can likely to spot these enigmatic creatures. They are primarily carnivorous but, as the name suggests, they are suckers for honey. They find hives by following the tweets of a bird called the honeyguide, which is attracted to honey. 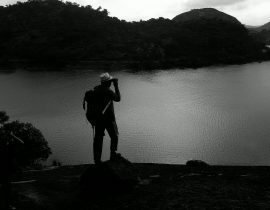 They are pretty handy with tools too, as they have been observed to use sticks, stones, and logs to obtain honey. In fact, they are considered one of the most intelligent animals on the planet. Nobody would want to come across this little fellow at night when it comes out to hunt. 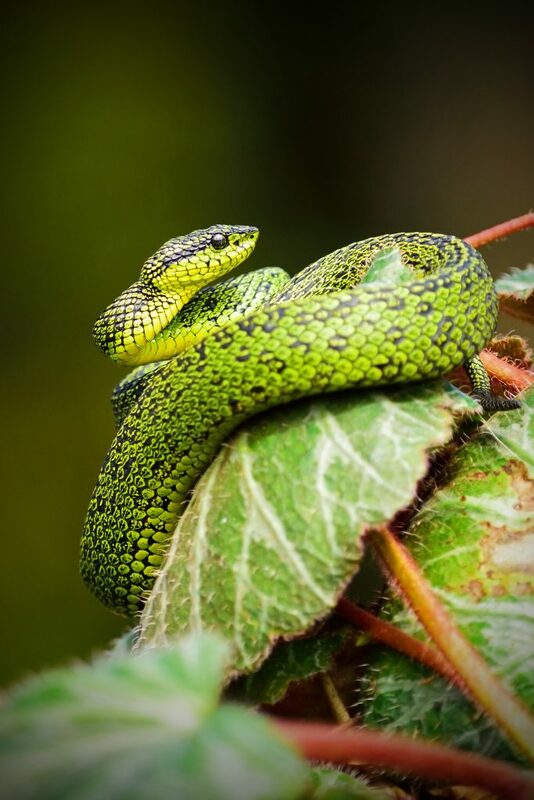 A carnivore predator lurking in the trees of Western and Central Africa’s tropical forests, the bush viper spends its days basking in the sun on top of flowering bush plants. This bizarre snake comes in many bright colours, as it adapts to the surroundings to camouflage itself. With unusually big eyes, head that is larger than its neck and covered in scales, it seems straight from outer space. Bush vipers prefer regions far from human settlements. 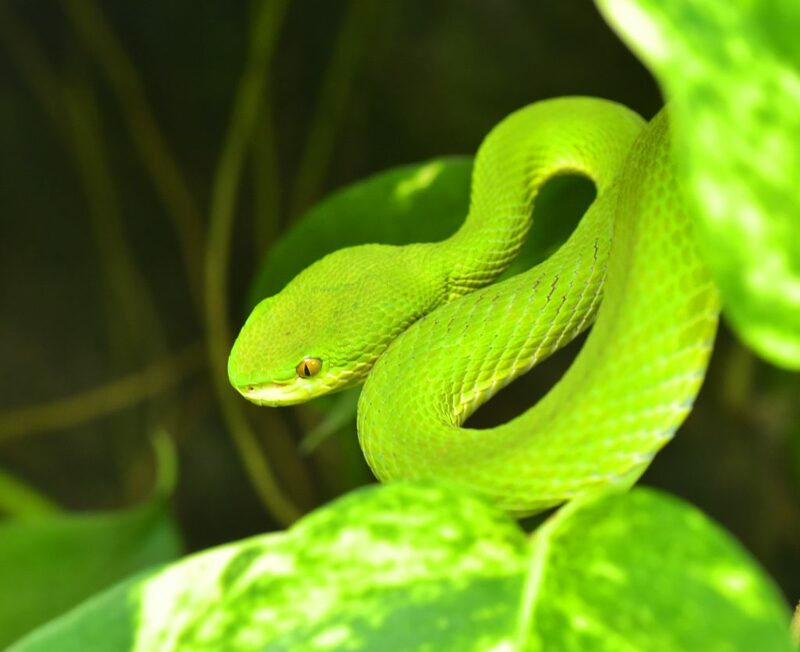 Quite venomous, their bite can prove fatal to humans as there is no antivenom. What are your first thoughts upon looking at these creatures? Miniature Yodas? They may not seem like it, but these are primates, related to chimps, apes and to us humans. 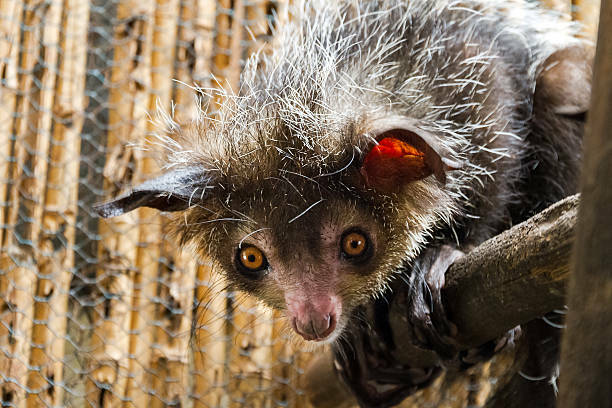 Native to the island of Madagascar, the bushy tail of an aye-aye is longer than its body. These nocturnal primates have large eyes and ears and live in rainforest trees, and avoid coming down at all costs. Aye-ayes are the only primates that use echolocation – using sound waves to determine the position of objects in space, like bats). Another method they use to find food is tapping on trees with their long middle finger and listening for insects moving under the bark. They use the same finger to fish them out. What other unusual animals do you know that Africa has?